Tropical storm Harvey in Texas in the United States has grabbed more international attention, but flooding in South Asia has been severe too. Already, 1,400 people have died, and another 44 million are affected. Harvey is an extreme storm that has set a new rainfall record. However, flooding in South Asia - a regular annual event - attracts limited attention worldwide. This year, among the main victims of this regular annual event have been the residents of Mumbai, India's financial capital. On Aug 29, the city received over 200mm of rainfall within a span of 12 hours, almost 11 times more than average. Roads were jammed with residents wading through knee-deep water. Trains were delayed. Overcrowded and flooded government hospitals are now facing the risk of spreading infections. Residents were reminded of the 2005 flood that left the city in a similar state of paralysis. Thousands of people lost their lives, and essential infrastructure - including airports, local trains, and power and telecommunication systems - was shut down. Sadly, no real lessons have been learnt from that flood. Indeed, for most of the monsoon season this year, a significant part of India has been submerged in flood waters. 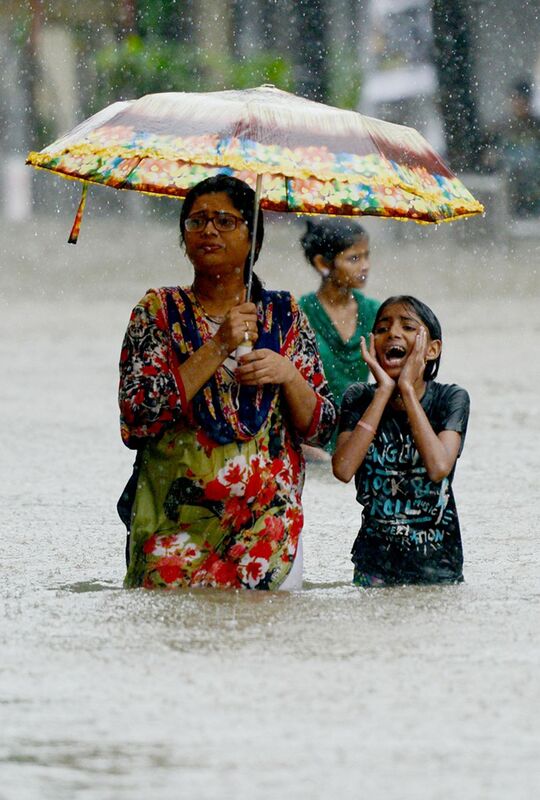 Incessant rains in Gujarat, Assam, Arunachal Pradesh, West Bengal, Odisha and Bihar have triggered floods, often leading to emergency situations. Most politicians, including Prime Minister Narendra Modi, have conveniently blamed climate change for these urban floods. India is one of the world's most flood-prone countries, with 113 million people exposed to floods. According to a United Nations report, India's average annual economic losses due to disasters are estimated at US$9.8 billion (S$13.1 billion), of which over US$7 billion can be attributed to floods. Another study of 164 nations, carried out in 2015 by the World Resources Institute, indicated that the Indian economy was the most exposed to flood risk at US$14.3 billion. The figure is expected to rise 10-fold to US$154 billion by 2030. Flooding in urban areas is most visible in the monsoon season, which extends from June to September every year. In the past decade, major cities such as Kolkata, Chennai, Delhi, Gurugram and Bengaluru have suffered havoc similar to that seen in Mumbai. Climatic impact on urban environments demands greater scrutiny and better planning. India has failed to offer any long-term solutions. Cities are hubs for economic growth. Already, India has the second-largest urban population in the world, behind only China. The UN estimates that, for the period from 2014 to 2050, the number of people settling in urban areas in India will rise by 404 million. Unplanned urban growth increases the risk of floods, especially since large numbers of people are concentrated in areas such as flood plains, deltas and coastal areas. Real estate-driven developments, poor city planning, lack of accountability at all levels of government and political neglect have compounded the problem. Given India's past experience with floods in urban areas, pre-emptive measures should have been taken to manage rising challenges presented by extreme weather events. Instead, urban ecosystems - comprising marshlands, wetlands, lakes and rivers that could moderate the effects of floods - have steadily deteriorated. Encroachment and illegal construction have steadily reduced the ability of cities to withstand serious flooding. Although politically convenient, climate change cannot be held solely responsible for the rising incidence of floods in Indian cities. Consider Bengaluru, which boasted an efficient storm-water drainage system of interconnected lakes. In the event that one lake overflowed, the water would automatically flow to another lake through connected networks. With increasing encroachment and solid waste blocking the channels, flood waters cannot flow to the next water body. Non-functional land-use planning has affected water bodies and drainage systems in other major cities such as Hyderabad, which has reported the extinction of 375 lakes, and Delhi, where 274 of 611 water bodies have dried up because of neglect and exploitation. Gurugram, which lies in a lowland area, has emerged as one of India's most important industrial hubs. Yet, many of its residential areas are still not connected to any drainage system. It is not surprising that the roads there are severely water-logged every monsoon season, which results in traffic snarls that last up to 20 hours. Action from municipal governments is essential to address urban floods. Without strict adherence to land-use planning and construction laws, it is impossible for any city to adequately plan its infrastructure. Not a single Indian city has a drainage system that can promptly deal with intense monsoon rainfalls occurring over short time spans. In the case of Mumbai, the Bombay Municipal Corporation (BMC) spent only about 10 per cent of its designated funds on civil infrastructure last year. A media report earlier this year revealed that a large proportion of BMC's money lies in fixed deposits earning interest for the corporation. Even funds used for renovating capital infrastructure address immediate civic pressures rather than provide for long-term infrastructure creation. A similar situation exists in other major cities, where the municipal corporations inflate their budgets but fail to carry out any significant developmental work. Part of the blame for India's urban infrastructure crisis also lies with citizen apathy. Nearly all cities have failed to encourage the adoption of rainwater-harvesting systems, even though such measures would greatly assist in diverting water to the subsoil or to a reservoir, instead of letting it overload the drainage system. Floods represent a major paradox for water management in India. Nearly all towns and cities are both water-scarce in dry seasons and prone to severe flooding during monsoons. Cities that experience floods every monsoon, such as Delhi, are also among the most water-stressed in the world. This is a serious indictment of India's water management. Flood waters in urban areas should be collected for use during non-monsoon seasons, through groundwater and surface storage. In the absence of such initiatives, urban citizens will continue to face the double problem of waterlogging and depleted groundwater tables, resulting in either too much or too little water. Lack of political will and public awareness, consistently poor water planning, pervasive corruption at all levels, absence of accountability at government institutions, public apathy and absence of persistent media scrutiny have all contributed to the situation. Floods are controllable with proper planning measures, including functional drainage systems, the storage of excess from floodwaters for use in dry seasons, and coordinated water- and land-use planning. India could follow Singapore's example to stop urban flooding. The Republic, which also has to deal with monsoons, has for the most part solved urban-drainage and water-security problems by installing a proper, functional drainage system and collecting all rainwater for urban use. It is high time Indian politicians stopped blaming urban flooding on climate change and started planning for secure urban futures. Asit K. Biswas is distinguished visiting professor at the Lee Kuan Yew School of Public Policy, National University of Singapore; Udisha Saklani is an independent policy researcher; and Cecilia Tortajada is senior research fellow, Institute of Water Policy, Lee Kuan Yew School of Public Policy, and editor-in-chief, International Journal of Water Resources Development.